A few months after 9/11 I received a phone call from Michele Fleury , the photo editor at The Advocate, a gay interests magazine based in L.A.. 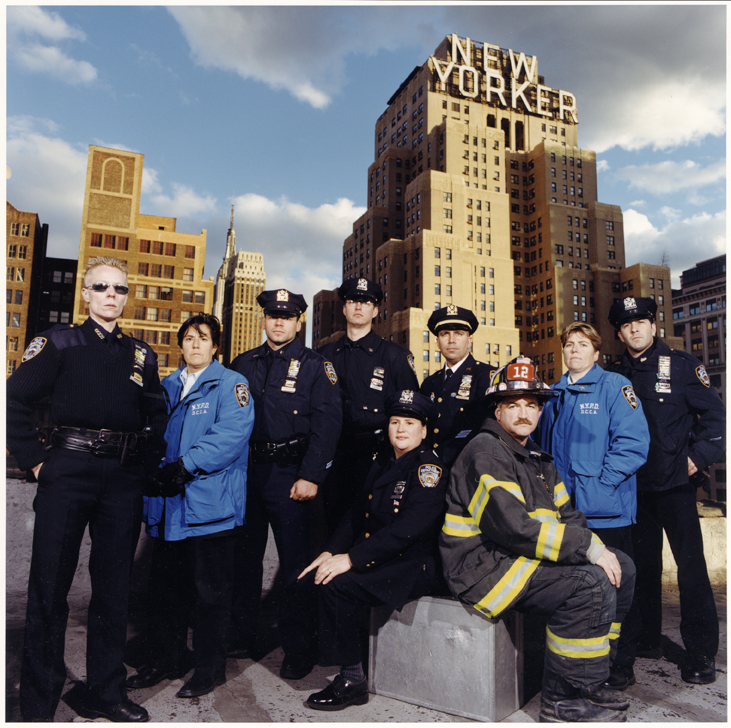 They wanted to publish a tribute to honor New York’s gay and lesbian police officers and firefighters and Michele wanted me to shoot a group portrait of some of these brave individuals. I was thrilled about the assignment to say the least. I’ve known about this rooftop location with full view of The New Yorker Hotel for a while since an acquaintance had his studio in this building. I’ve always wanted to shoot there but held back until I needed the “ultimate” NY backdrop. Obviously now was the time. I called my buddy and asked if he could get me up on the roof. He hemmed and hawed a bit but finally agreed for a reasonable fee. Rooftop access wasn’t really in his studio lease, but I figured once I was up there with a bunch of cops I could talk my way into or out of anything. The group shot went pretty smooth even though we had only one fireman. The FDNY was still so decimated from all their losses during the attacks that only one of the openly gay firefighters could make it to the shoot. Some of the stories we heard that day were truly heartbreaking. One of the police officers, who was securing the area downtown during the attacks ran into his boyfriend, a firefighter on that September morning. They talked briefly and then went on to do their jobs. The cop survived, the fireman did not. Everybody in this picture lost friends and colleagues that day. It’s still hard to think back to all the grief that came to New York that day. Beside the group shot there was another picture I wanted to do that day. 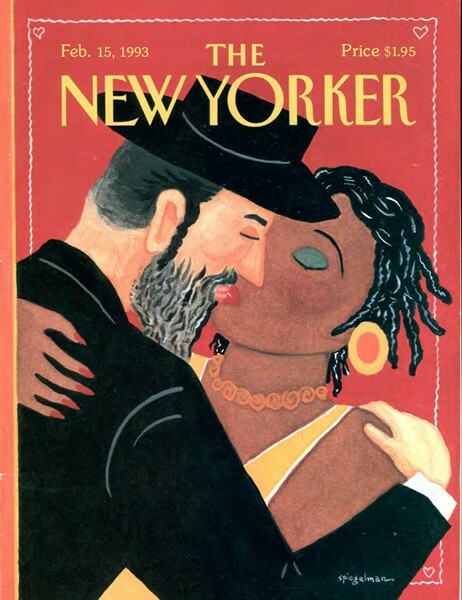 Part of the inspiration came from a 1993 New Yorker Valentine’s Day cover by Art Spiegelman. In the summer of 1991 a car that was part of a motorcade for a hasidic Rabbi, spun out of control in Crown Heights, Brooklyn and killed 7 year old Gavin Cato, the son of Guyanese immigrants. The Jewish driver of the car was beaten by bystanders and taken from the scene by a Jewish ambulance while police and other EMT were still trying to free the child from underneath the car. Black locals perceived this as favoritism and became outraged. Rumors and allegations started flying, mixed with long held grievances, stewed in the August heat, and finally exploded in what became known as the Crown Heights Riots. A few hours after the deadly traffic accident a young hasidic scholar named Yankel Rosenbaum was stabbed to death. The riots went on for a few days, partially because Mayor Dinkins couldn’t bring himself to act decisively against the violence. These events probably cost Dinkins his job and poisoned race relations in New York for years. A while later the Valentine’s Cover appeared on newsstands and started a big controversy. People were outraged, outraged I tells ya. But when asked what was so outrageous about kissing a Jew or a black person, well, a few brave, confused souls contorted themselves in pseudo theological arguments but most just knew better and shut up at that point. I had never read the New Yorker before, my English wasn’t up to snuff back then, but I had been a fan of Spiegelman ever since I’d read Maus, and I was totally amazed that a magazine would do a cover like that. To throw a nice little peace bomb into a hateful situation, to help a city return to civility, was just a fantastic piece of publishing. It also drove home the point that you can express certain things with a picture that cannot be expressed with words. That cover drawing popped back into my mind when Michele called me with this assignment. 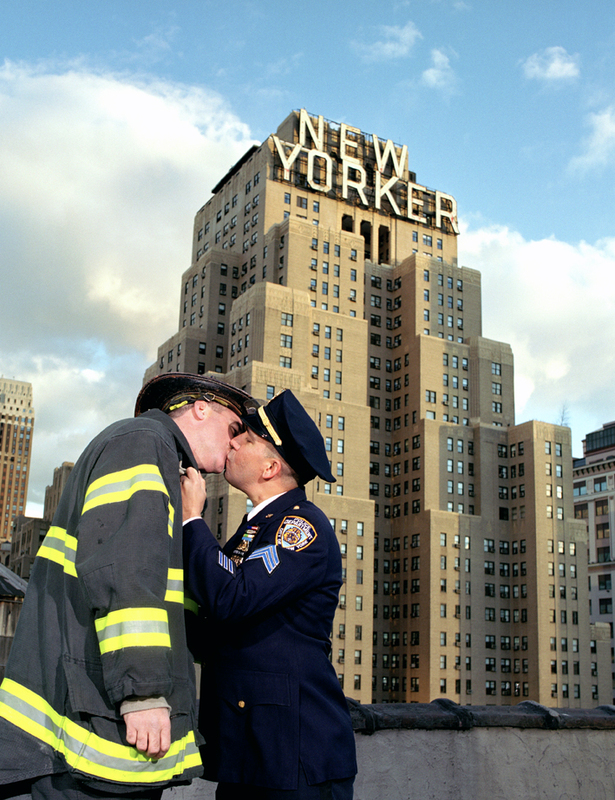 The rights of gays and lesbians represent probably the last major frontier in the long struggle for equality in the US and I thought photographing a kiss between a gay cop and a gay firefighter could be my modest contribution to the cause. But when the shoot came I was extremely nervous about asking for the kiss. Obviously there was only one firefighter (so I knew who to pick from that camp) and I thought I should probably ask the friendliest cop, but they were not boyfriend and boyfriend and I was afraid that I would piss them off with my request. Plus, I didn’t want them to think that I’m turning the 9/11 tribute into a joke. So, first I made sure we got the group shot in case they would walk out on me, all the while I was thinking about the proper way for a man to ask a man to kiss another man. Then I took several deep breaths, counted to 10 and just as I was about to pop the big question the friendliest cop started telling me a story about how he and the fireman met a few days earlier in a subway station, both wearing uniforms and how they greeted each other with a big hug and a kiss, and how that was a total freaker-outer for a bunch of subway riders. At that point I just asked if they would recreate that scene in front of my camera and both were immediately into it. Easy as pie. There was one kind of funny observation I had during the shoot concerning the gay men. By no means would I call my “gaydar” above average but on all the other Advocate shoots I’ve done, I would have known that the guys were gay even if I hadn’t known it already. Yet with these guys in uniform it was different. If I had met them while they issued me a traffic ticket (that’s how I normally hang out with cops), I wouldn’t have thought in a million years that they were gay. I met some of them again a few months later to give them prints from the shoot and now in civilian clothes they were pretty clearly gay. When they were in uniform it was like they switched something on (or off for that matter). Years later this is still one of my favorite pictures and as an added bonus it made it into American Photography 19.